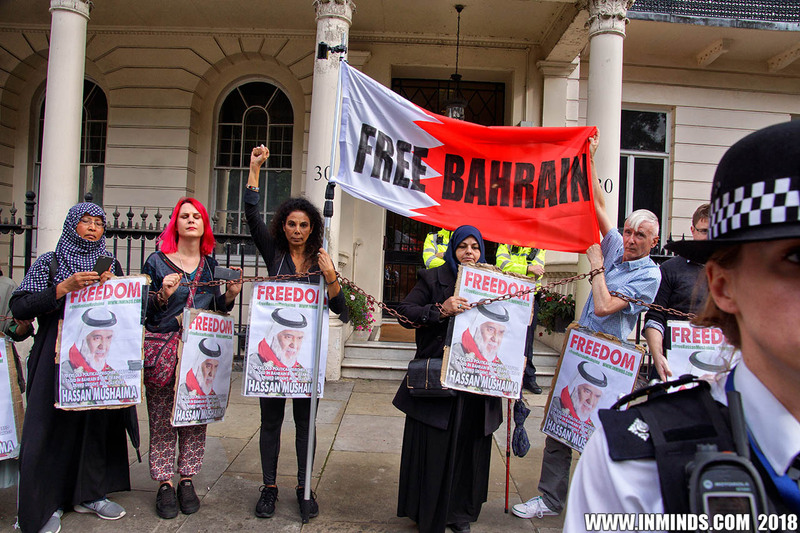 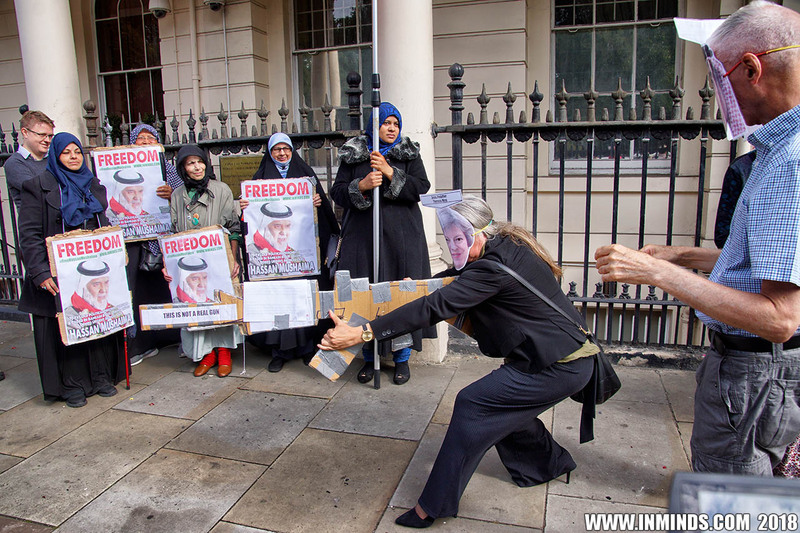 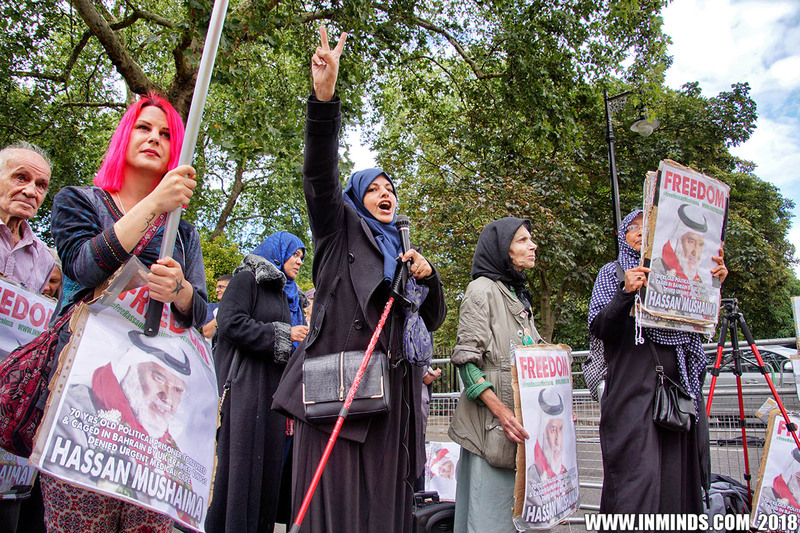 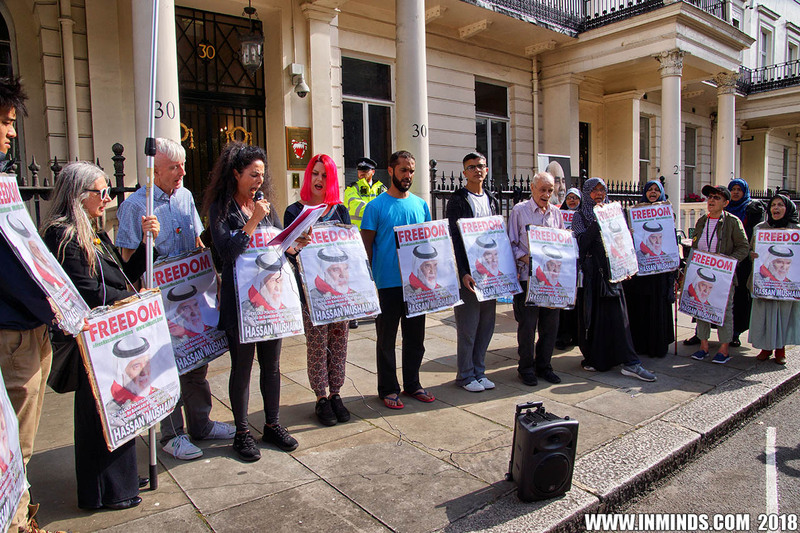 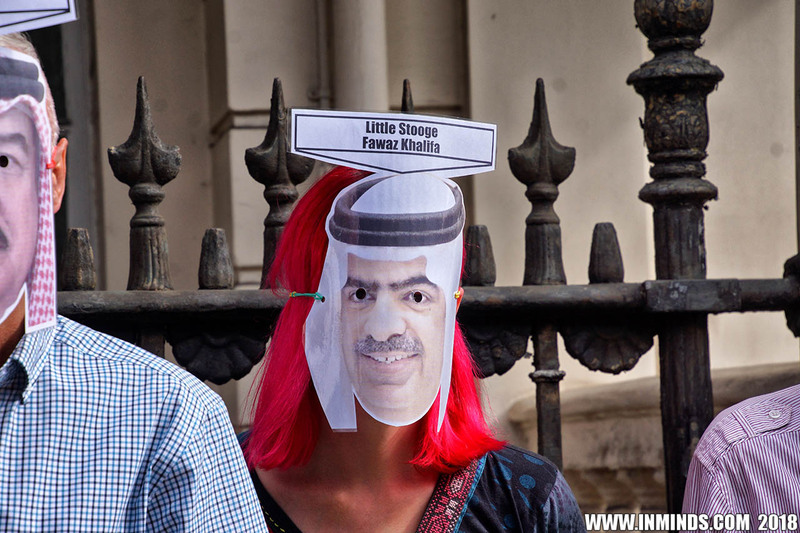 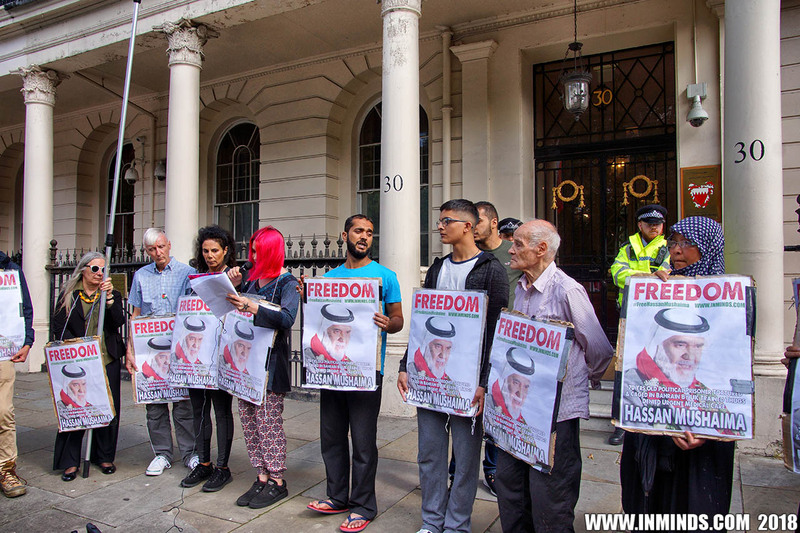 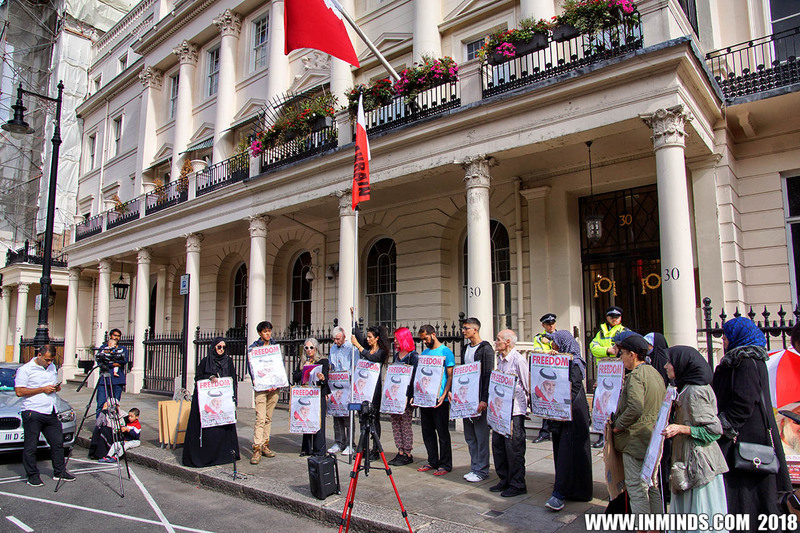 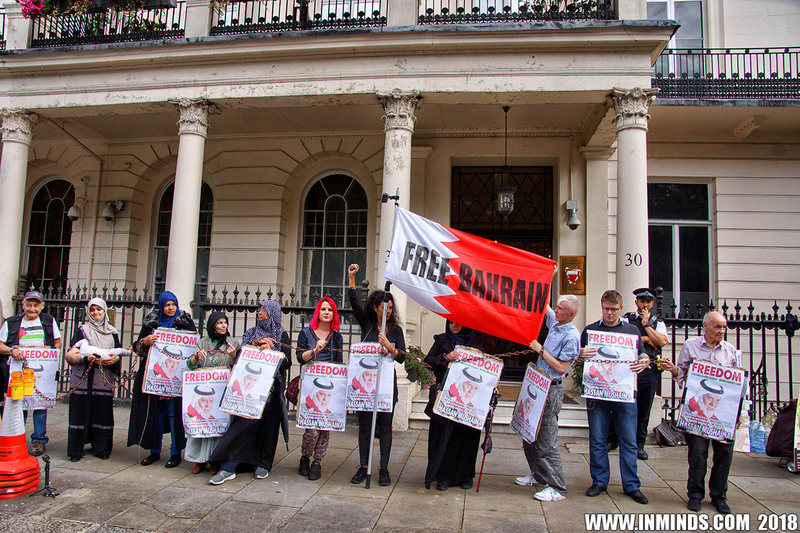 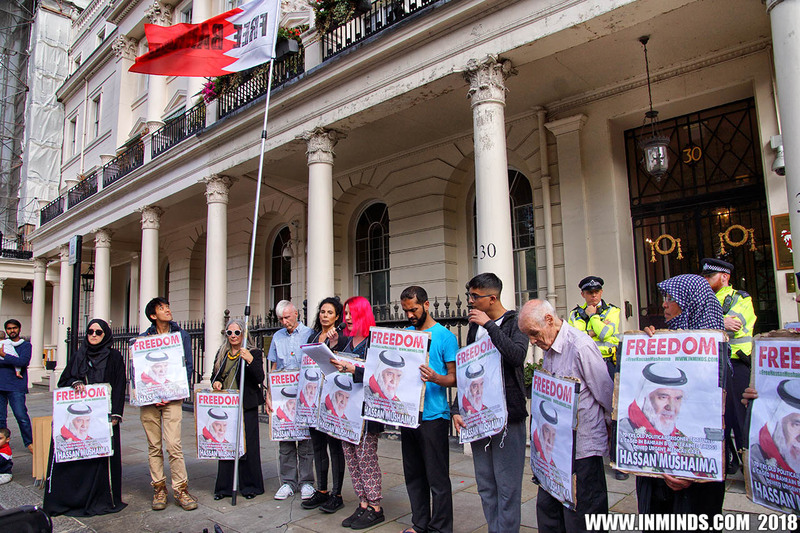 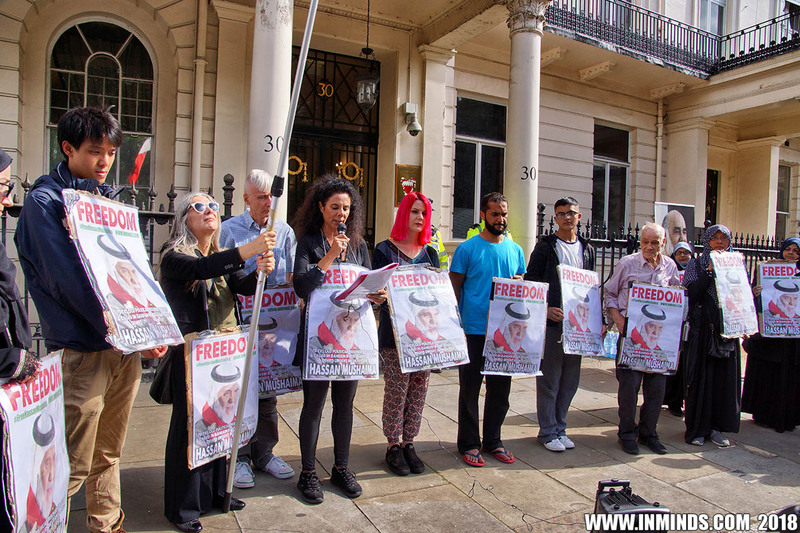 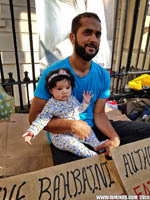 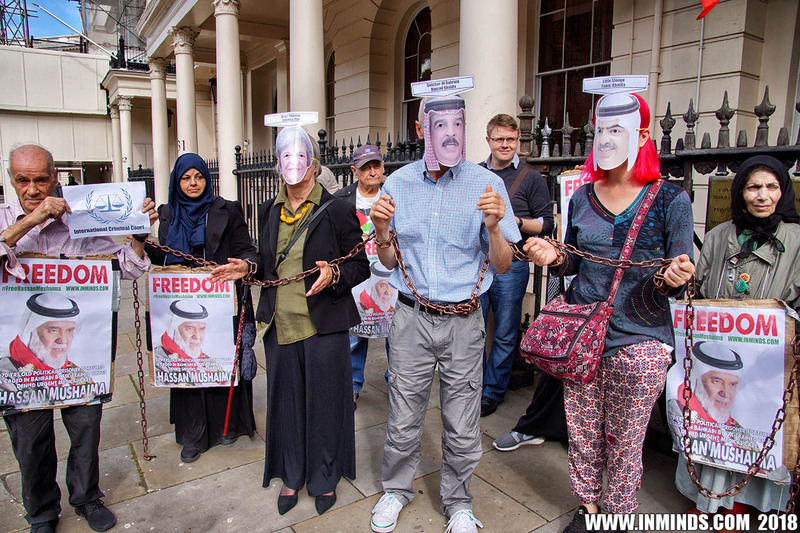 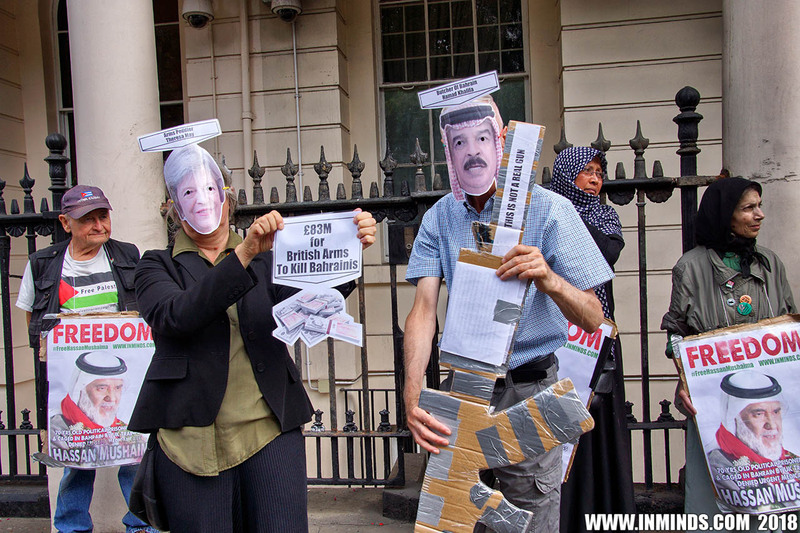 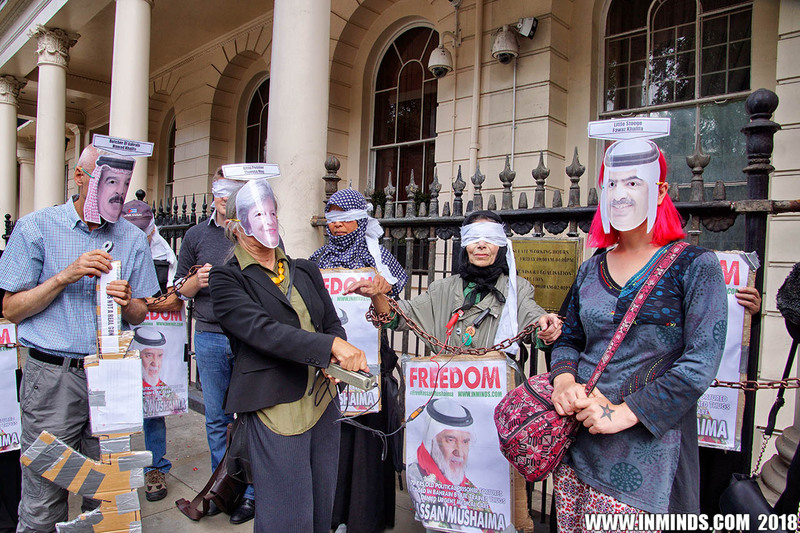 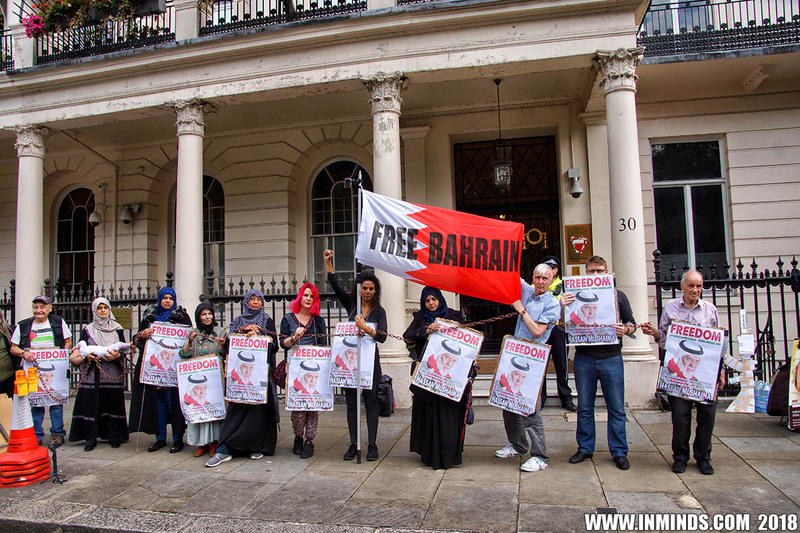 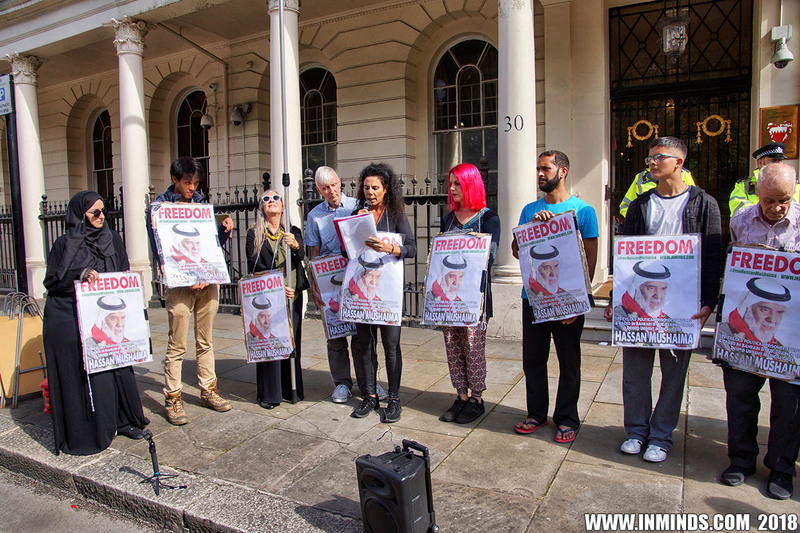 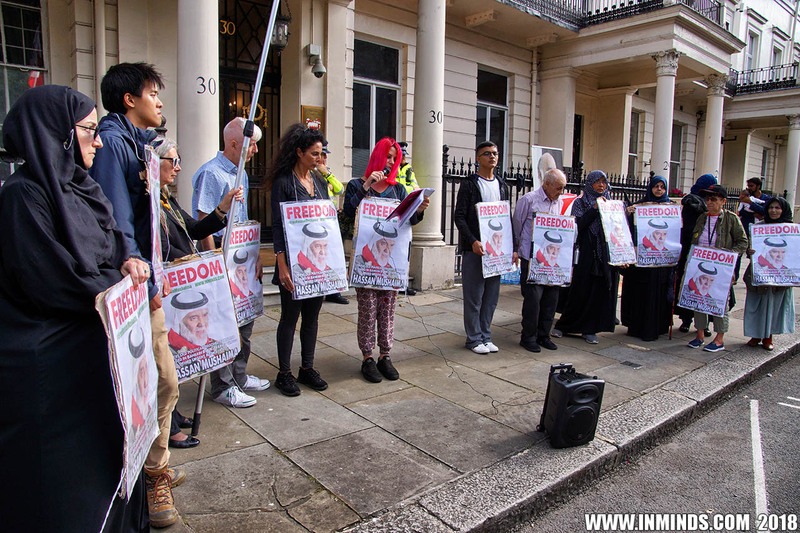 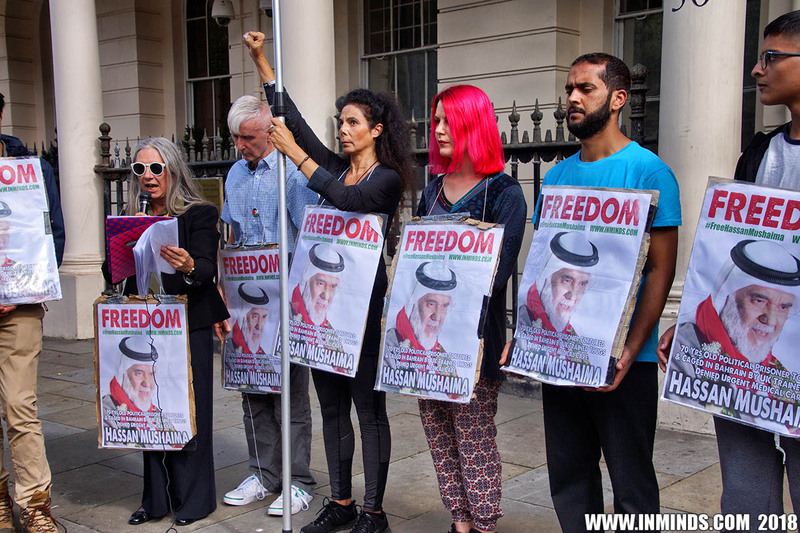 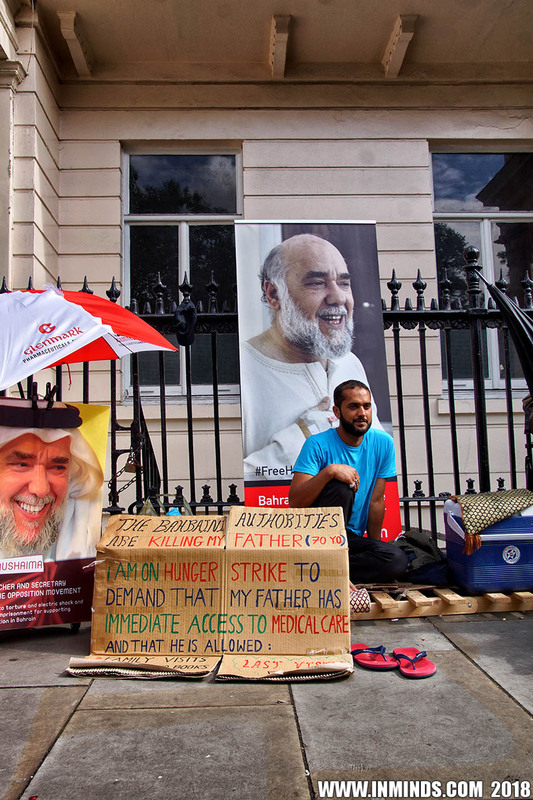 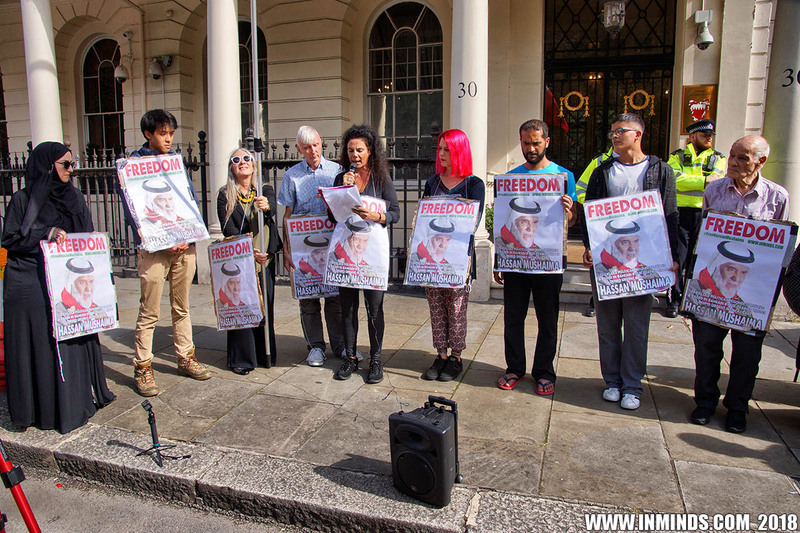 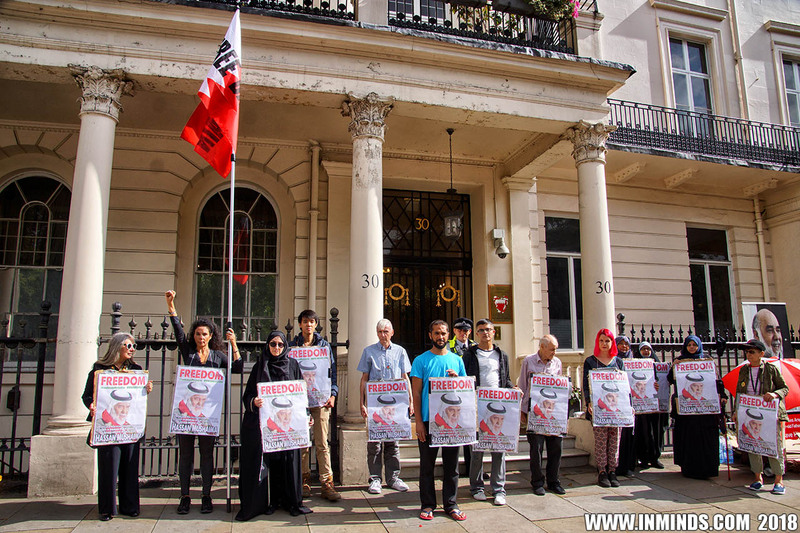 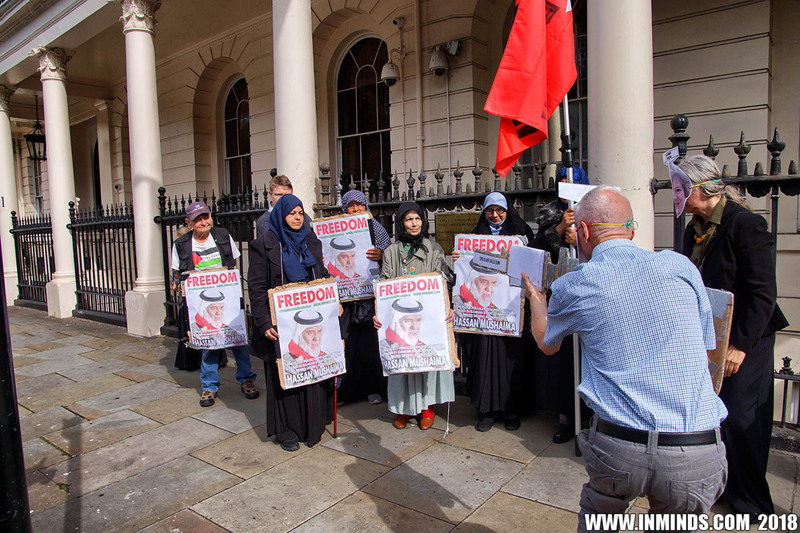 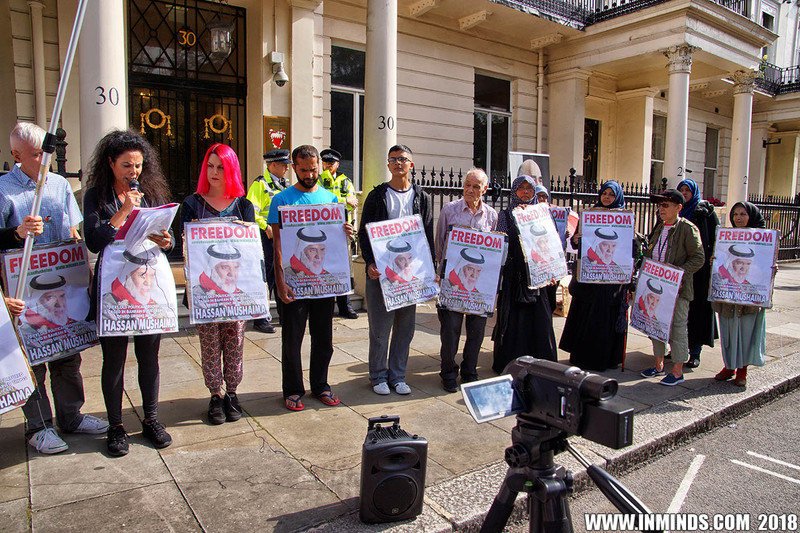 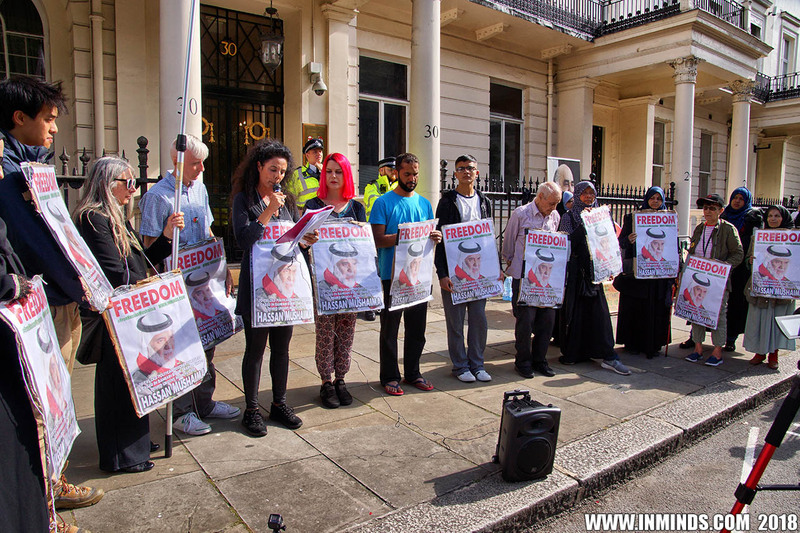 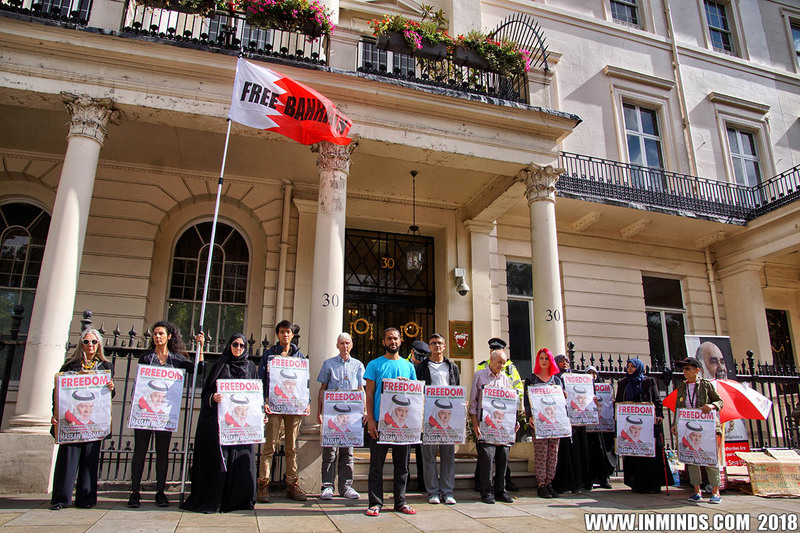 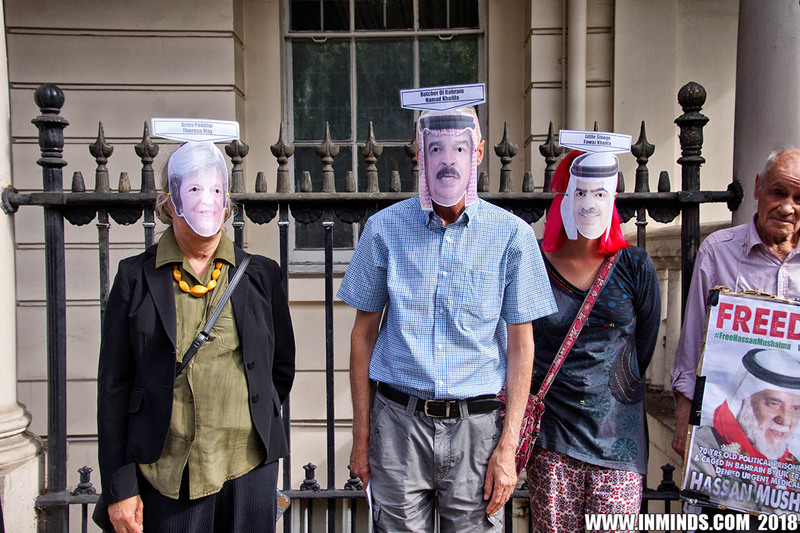 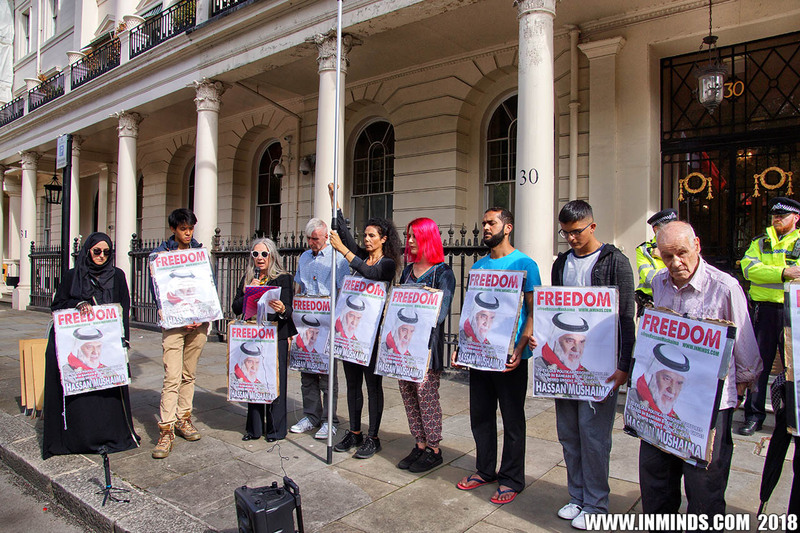 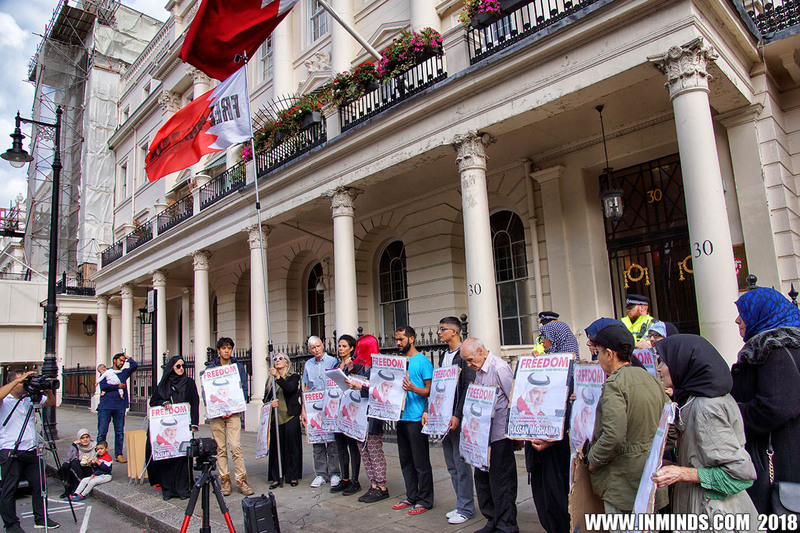 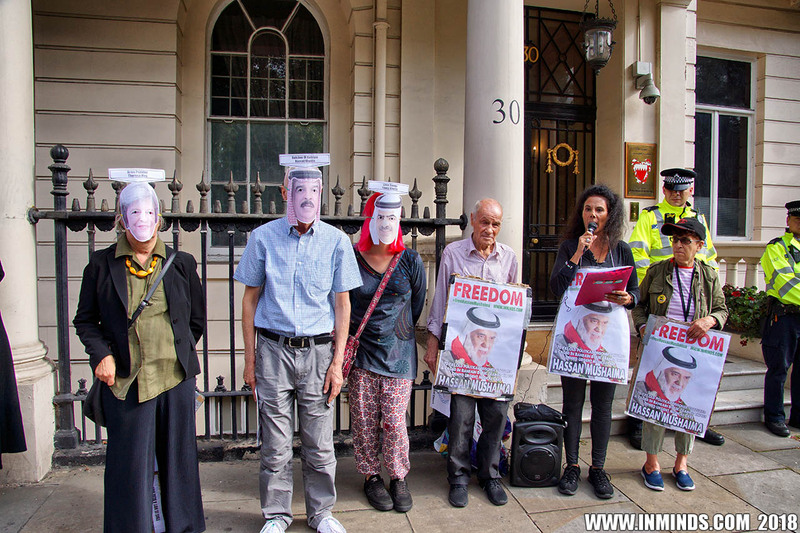 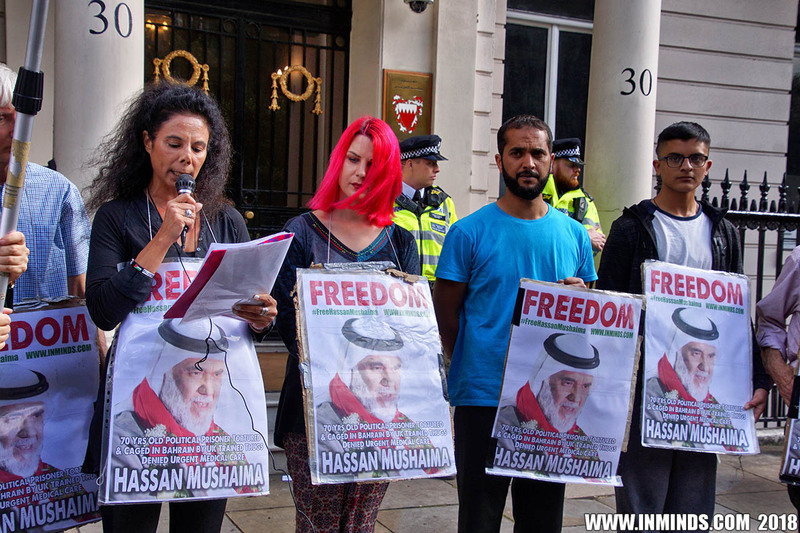 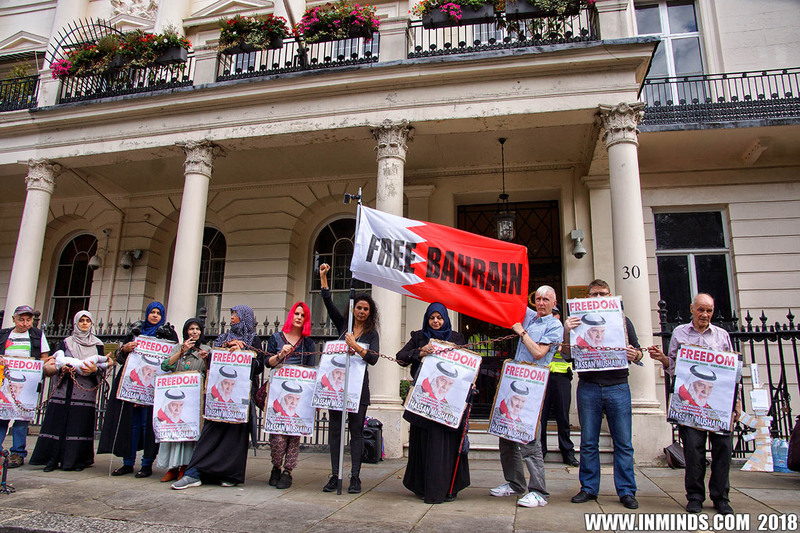 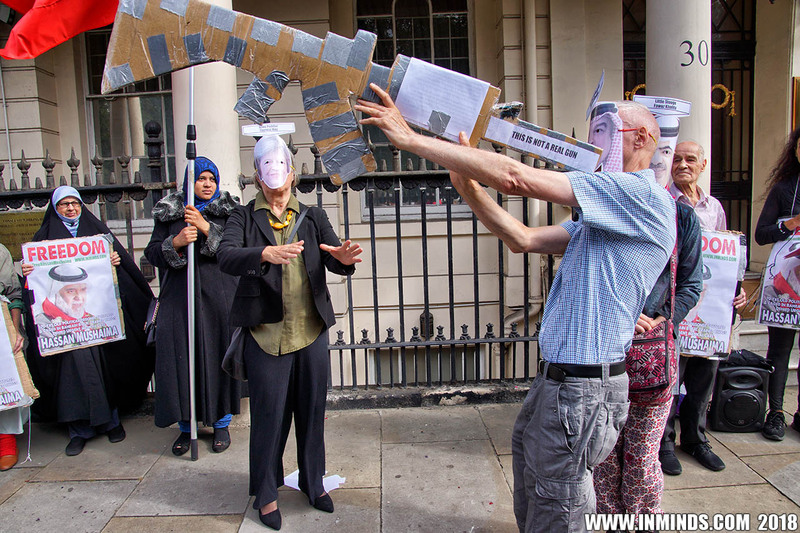 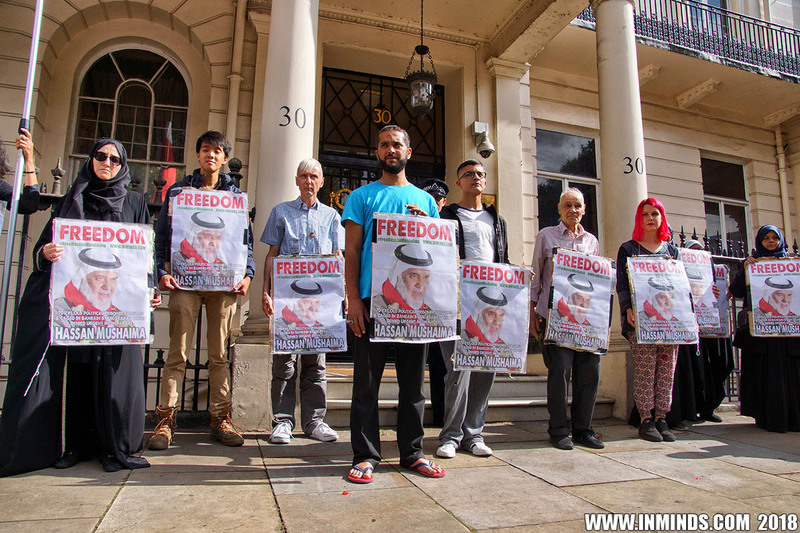 Following an attack by the Bahraini embassy on hunger striker Ali Mushaima in the early hours of Sunday 12th August 2018, Inminds human rights group held a second vigil on Monday 13th August 2018, outside the Bahraini Embassy in London, to demand the MET police arrest the guilty criminals hiding in the Bahraini embassy. The vigil was in solidarity with Ali Mushaima's hunger strike to save his father, prisoner on conscience, Hassan Mushaima's life. 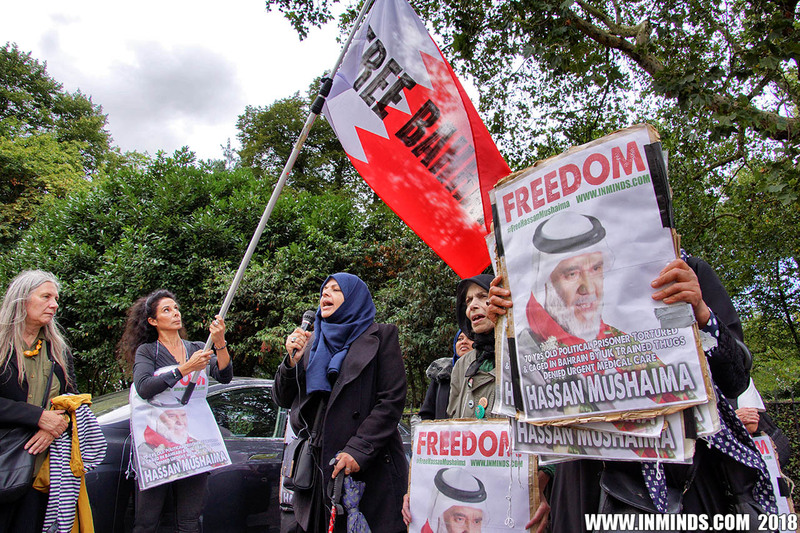 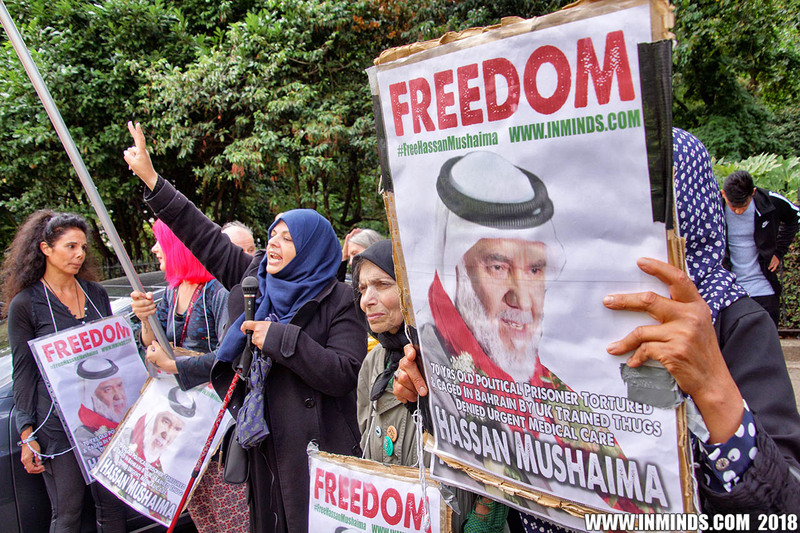 Inminds demanded the unconditional release of Hassan Mushaima and all the other 5000 Bahraini prisoners of conscience languishing in the Al-Khalifa regimes dungeons. 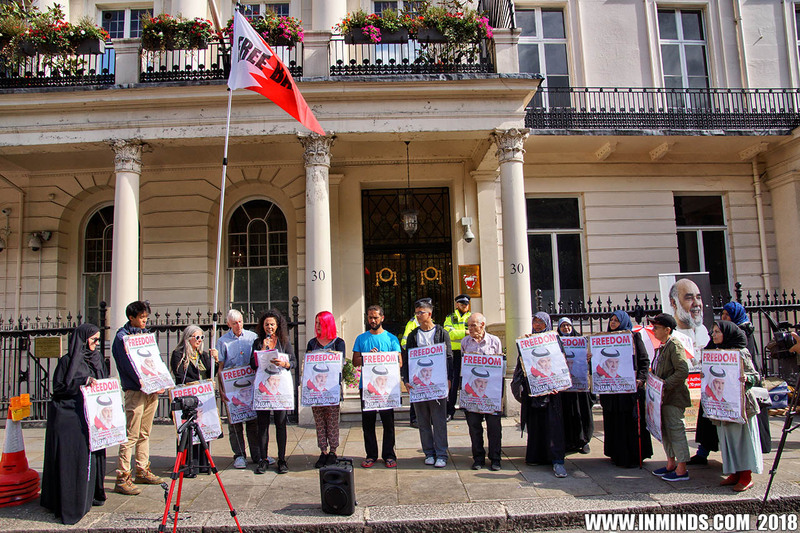 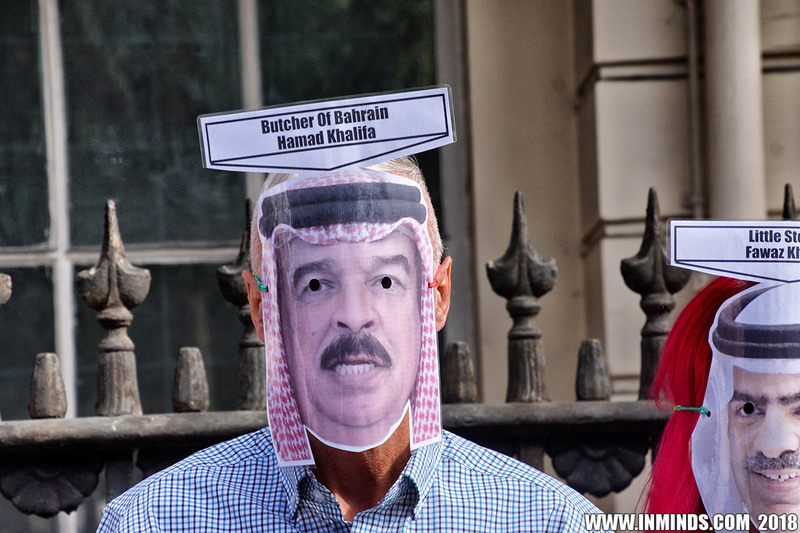 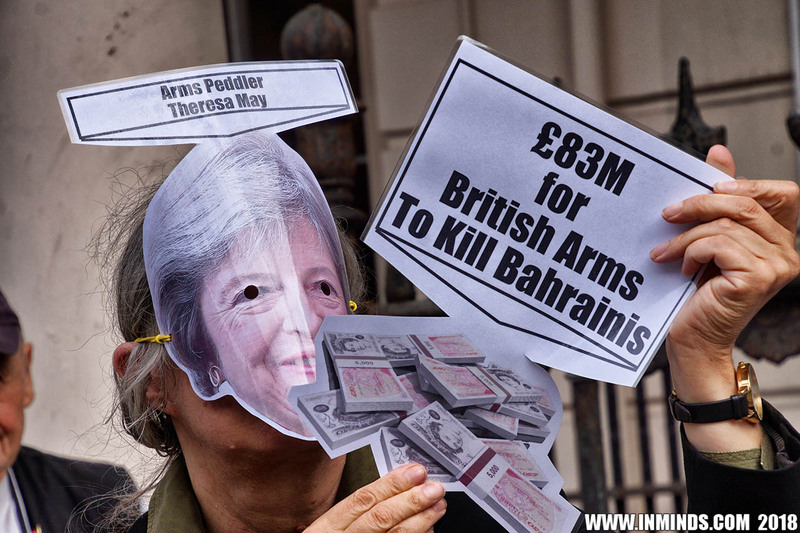 The vigil also demand the British government end its complicity in the Al Khalifa dictatorship's crimes against the Bahraini people. 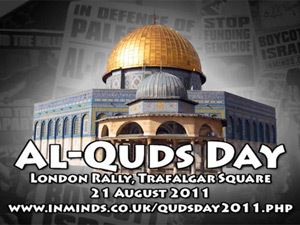 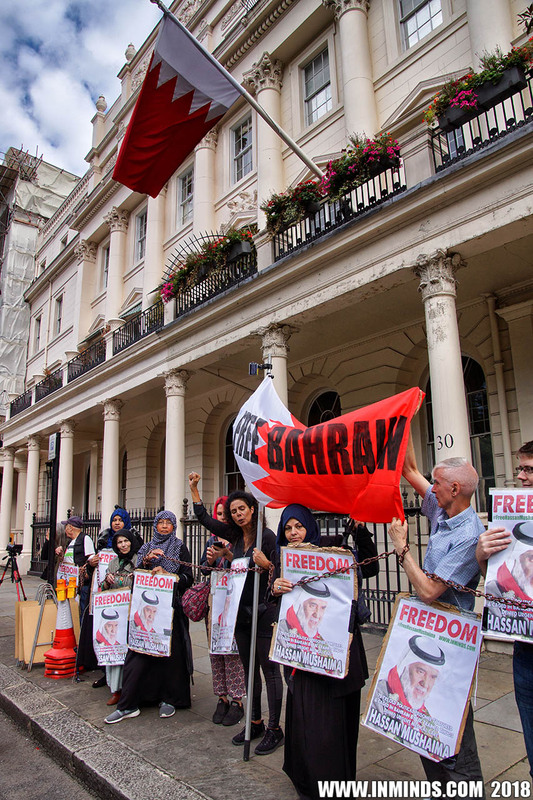 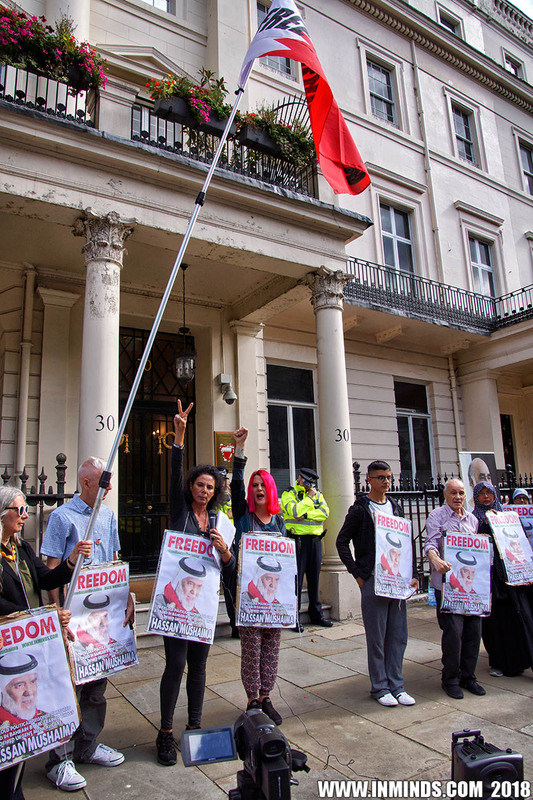 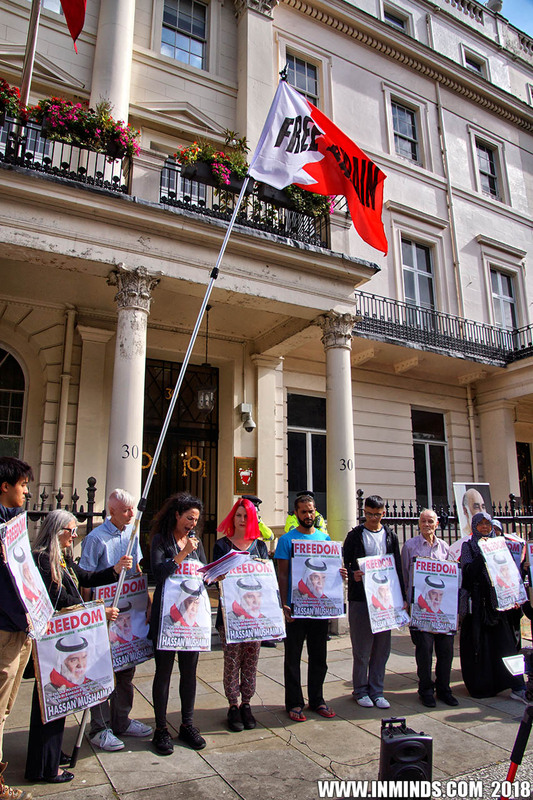 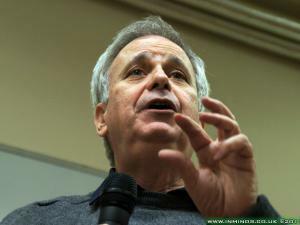 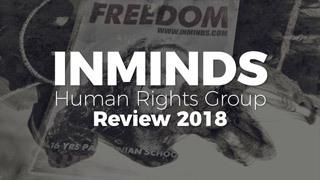 Inminds chair Abbas Ali said "This disgusting attack by the Bahraini Ambassador Fawaz Al Khalifa's embassy is a sign of just how weak the Khalifa regimes grip on power is that they fear one man's hunger strike shaking their throne. 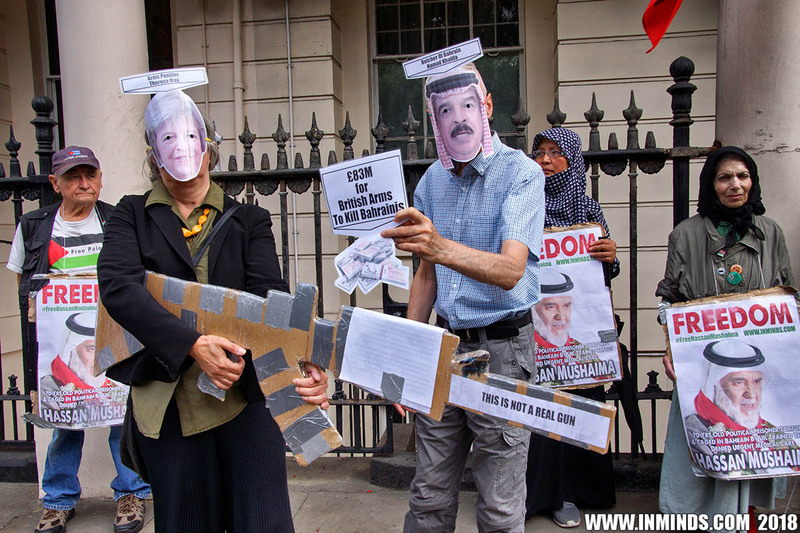 These thugs feel compelled to export the barbaric tactics they use on peaceful protestors in Bahrain to the streets of London. 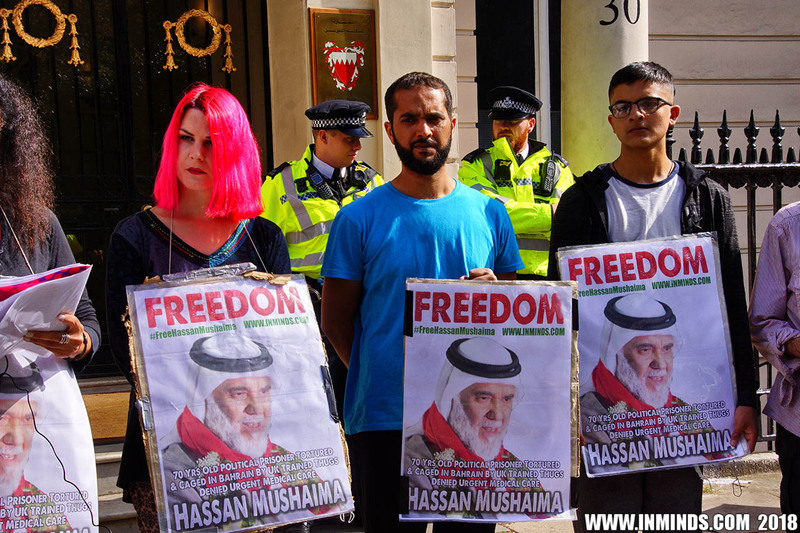 We demand the police act to bring these perpetrators, of what could easily have been an acid attack, to justice.. not everyone in the embassy has diplomatic immunity, and we demand Ambassador Fawaz Al Khalifa be thrown out. 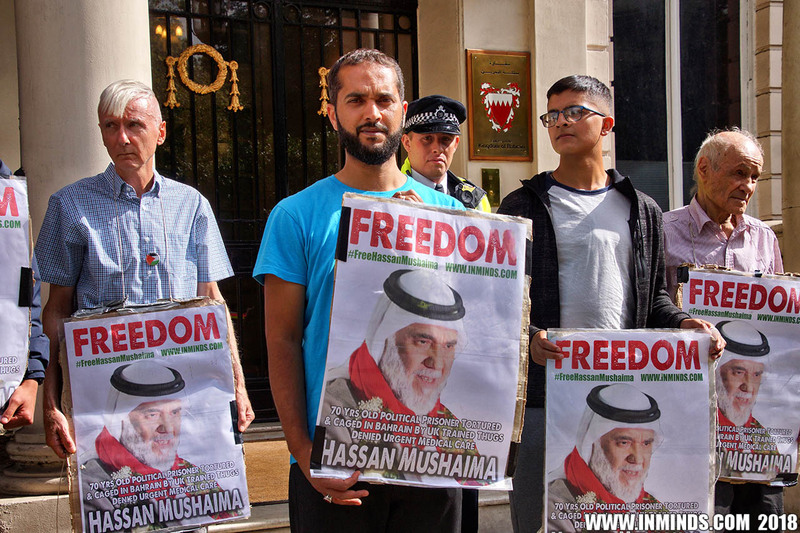 But it must be remembered that it is the British government that is directly responsible for the repression of the Bahraini people, the British government trained the thugs that abducted, tortured and imprisoned Ali Mushaima's father. 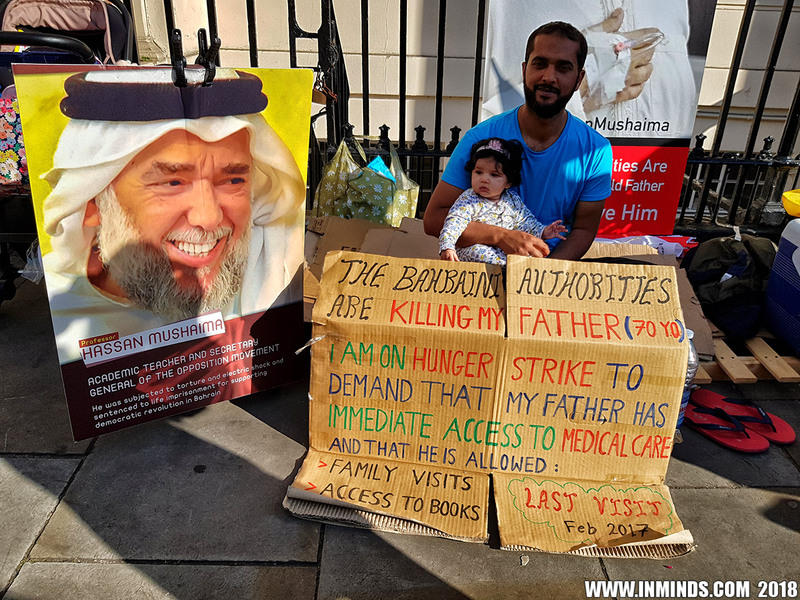 Today Ali Mushaima is on hunger strike, endangering his life to fight for the life of his father. 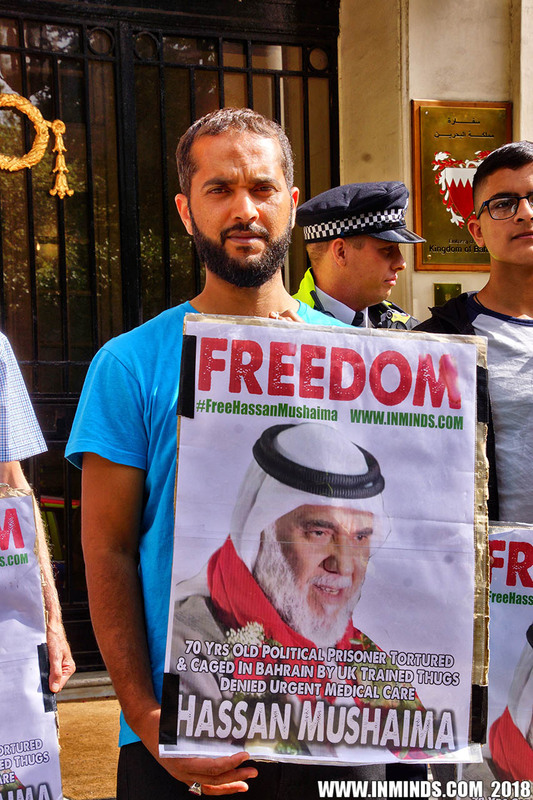 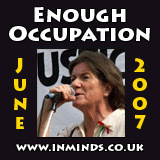 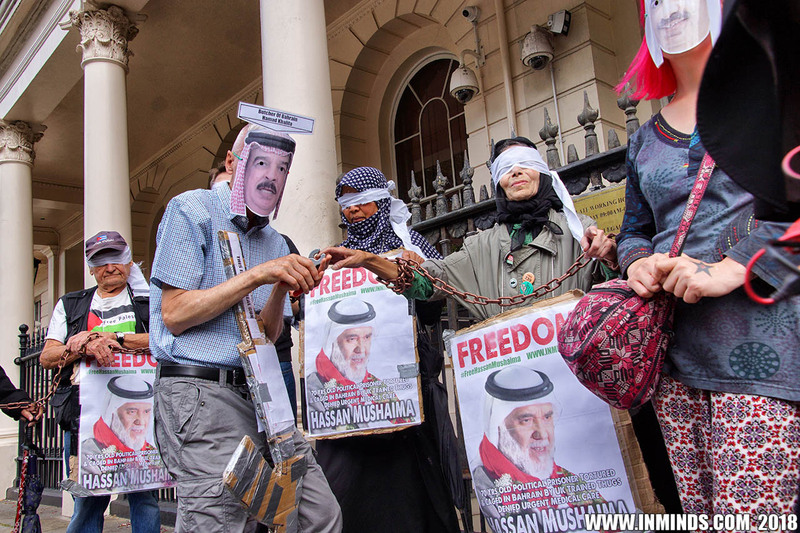 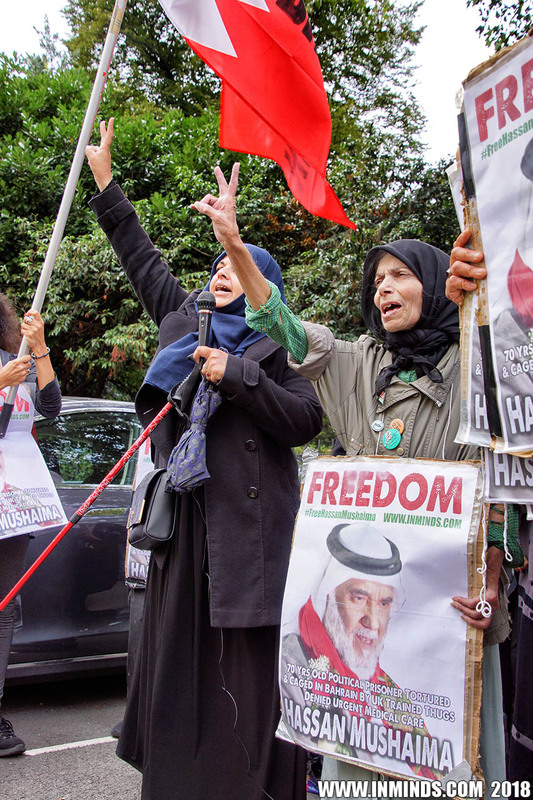 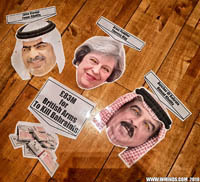 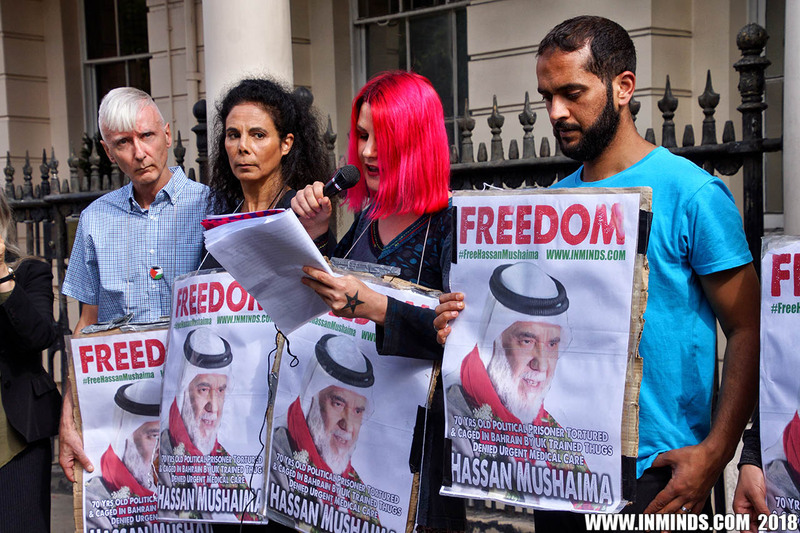 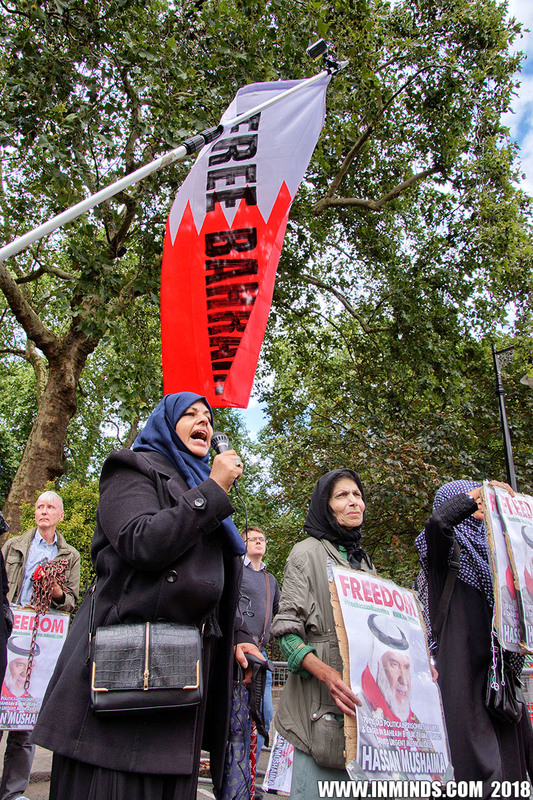 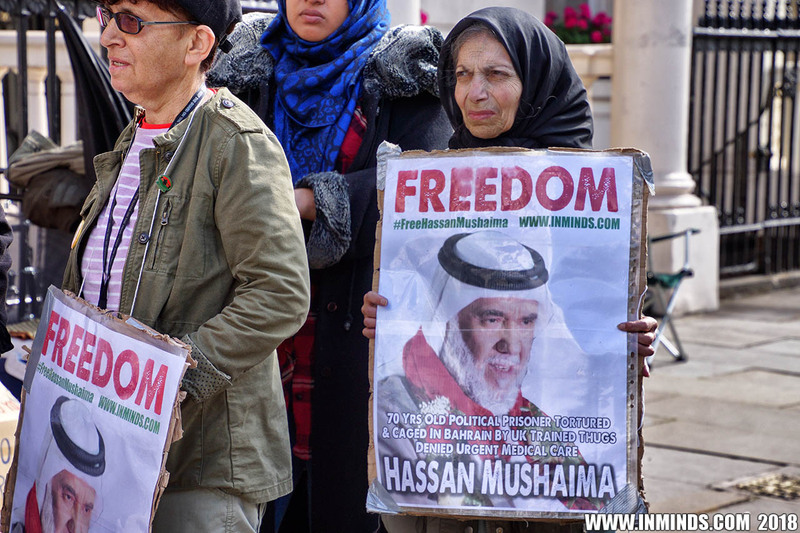 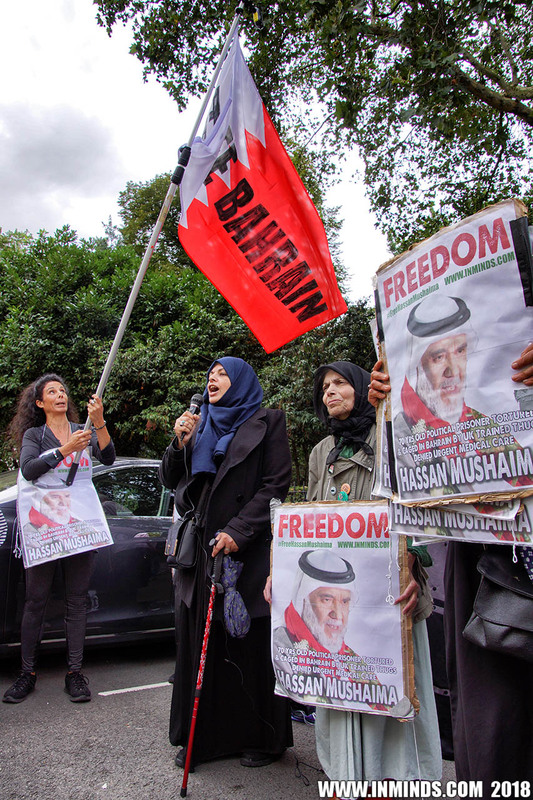 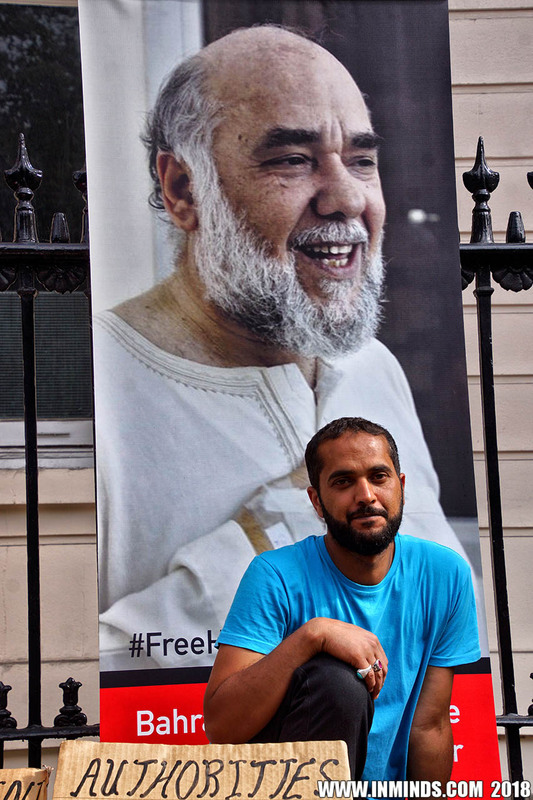 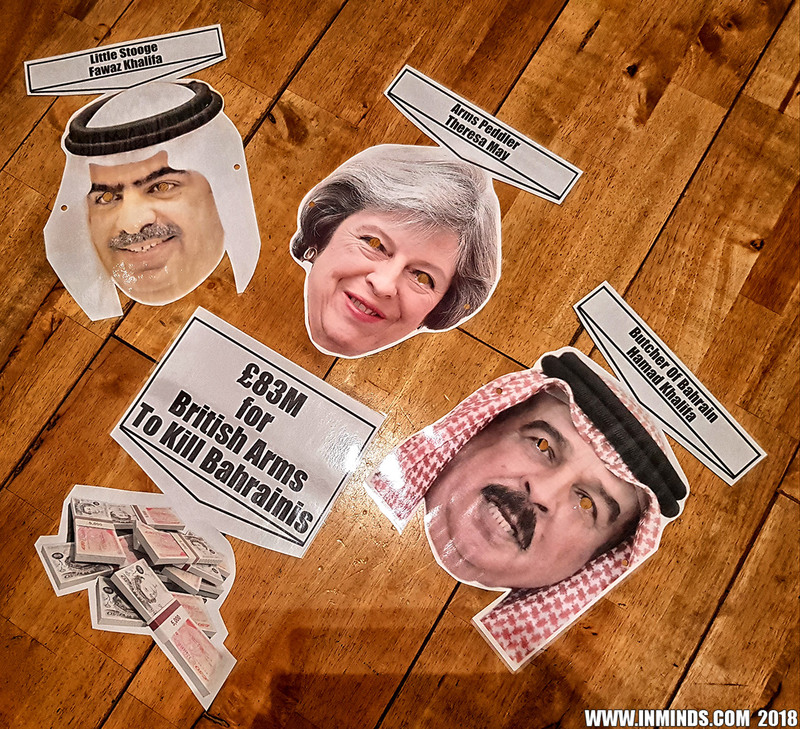 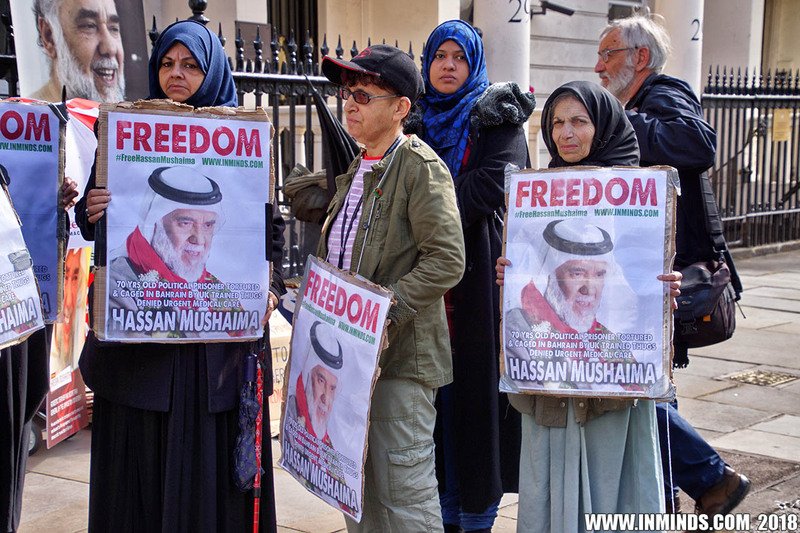 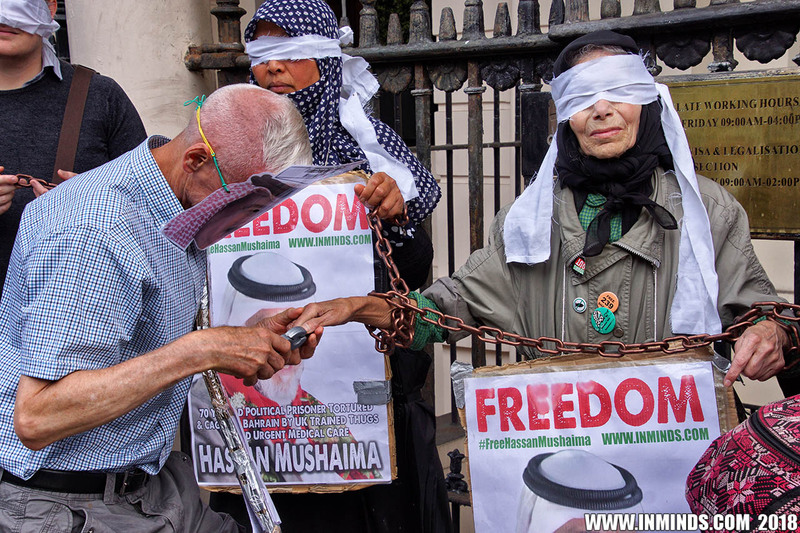 As citizens of this country it is our responsibility to speak up and demand the British government stop its support for the butcher of Bahrain, and act now to pressure the Bahraini regime to unconditionally and immediately release Hassan Mushaima and the 5000 other political prisoners caged in its dungeons!" 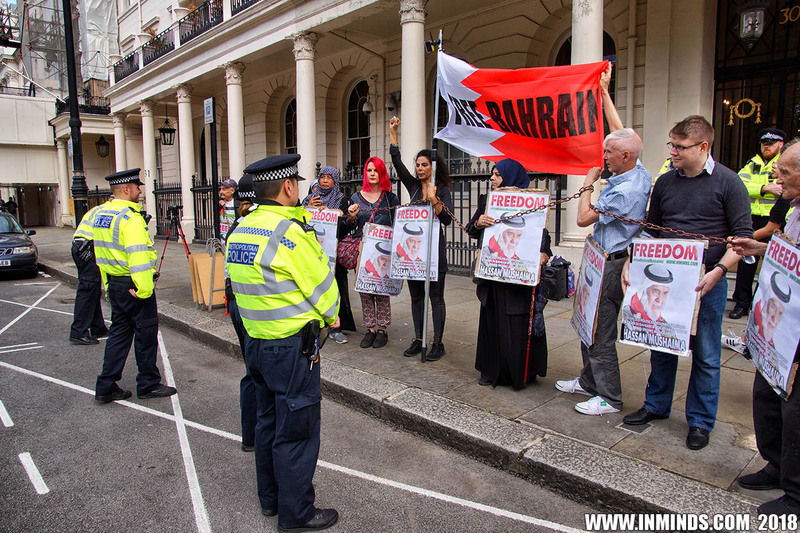 In the last 15 minutes of the protest the police succumbed to pressure from the Bahrain embassy and insisted on moving us across the road away from the embassy. 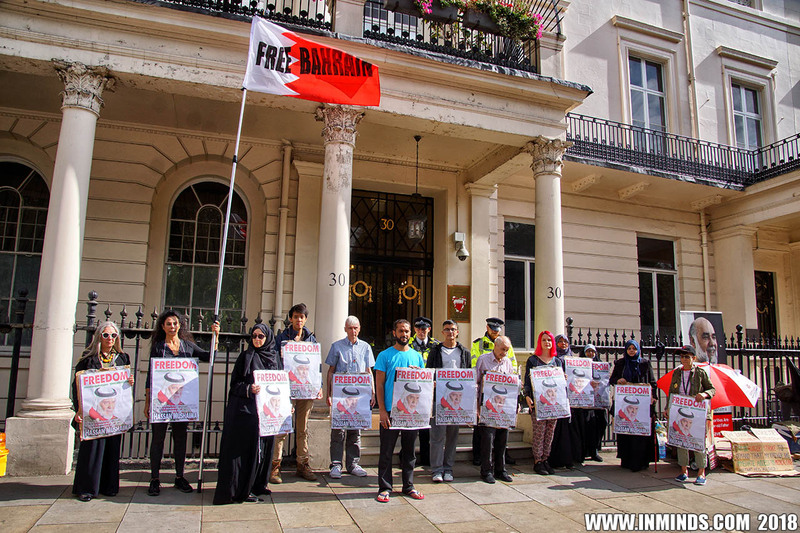 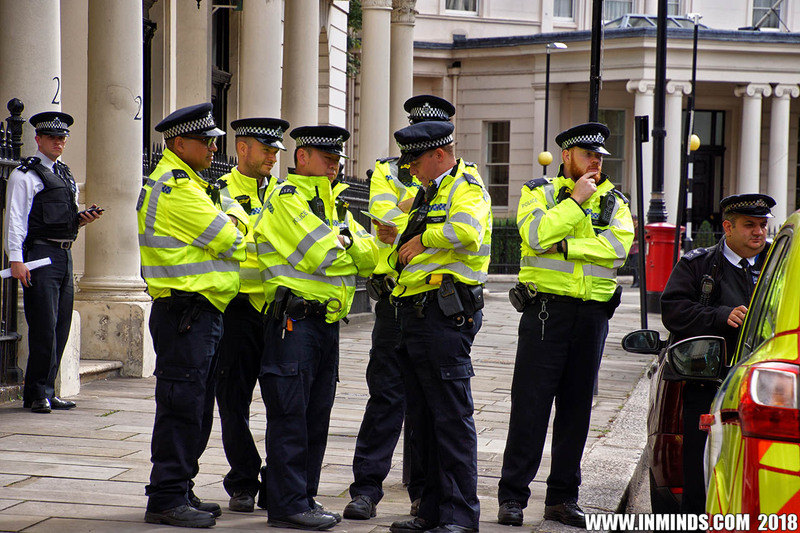 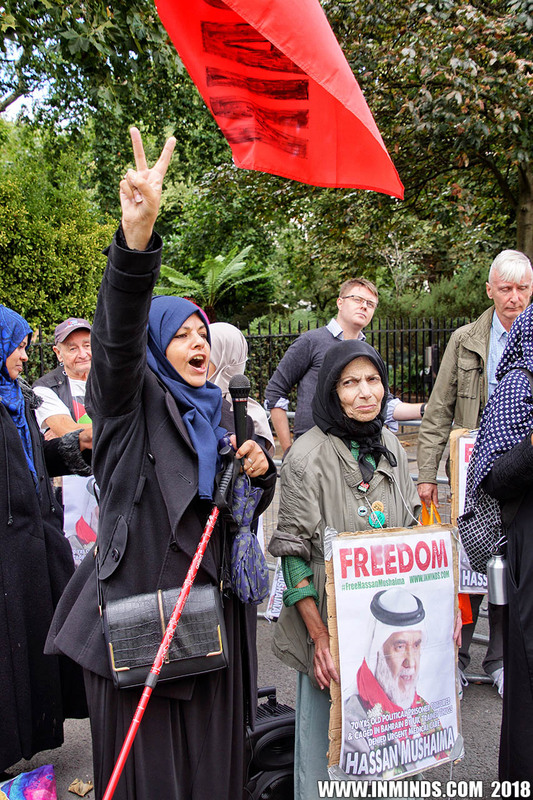 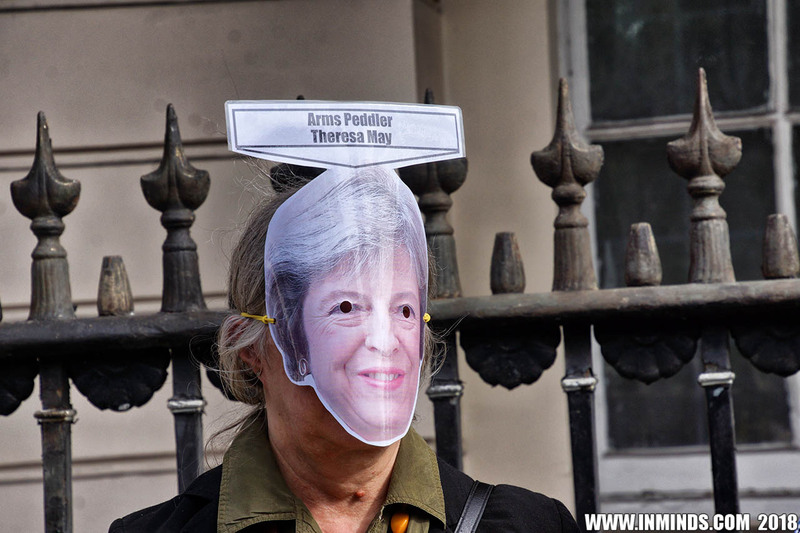 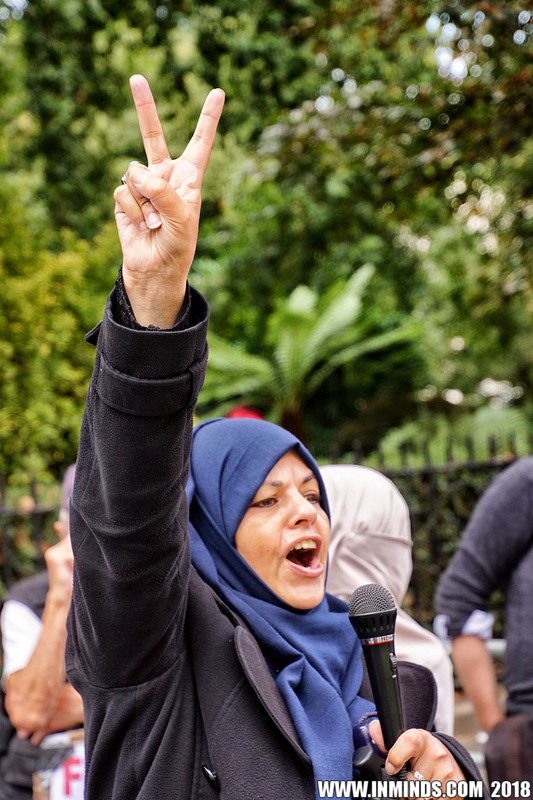 They had received complaints from the Bahraini embassy as to why they were allowing us to protest outside their embassy, where as in Bahrain the regime wouldn't allow such things - the police would probably shoot the protestors. 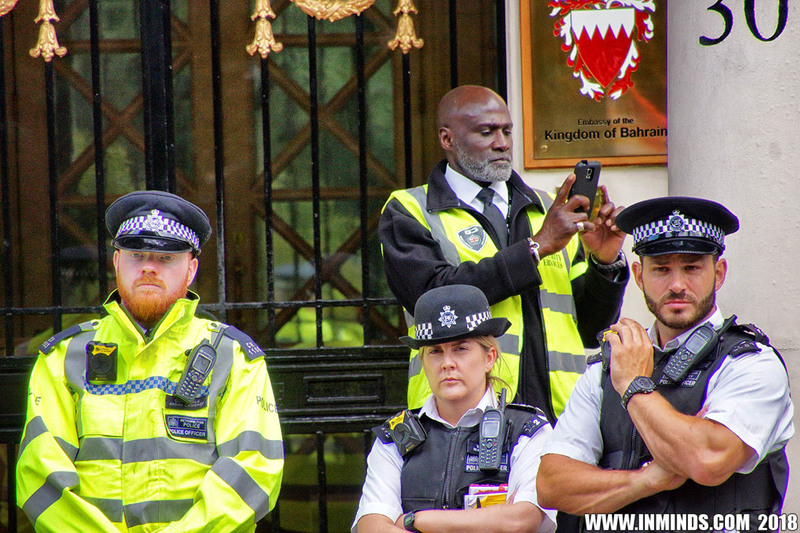 To force us to move the police unbelievably imposed conditions on our protest under section 14 of the Public Order Act 1986. 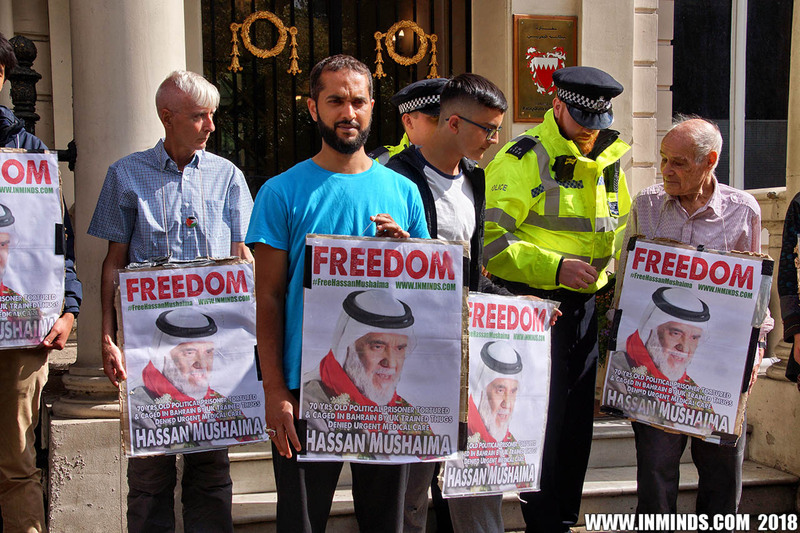 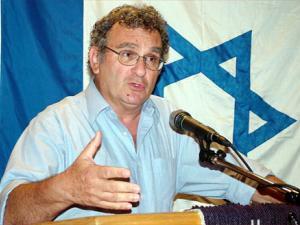 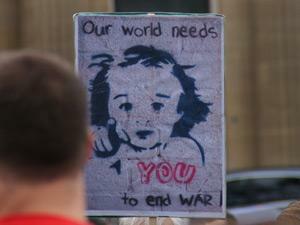 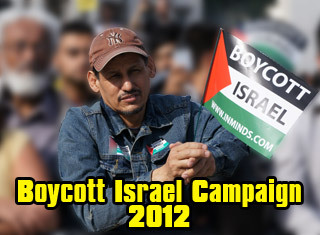 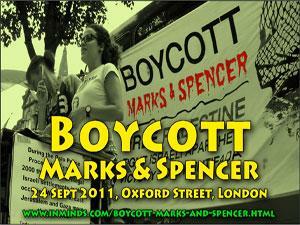 We were not a threat to anyone, this was a shameful abuse of the law in order to appease a dictator. 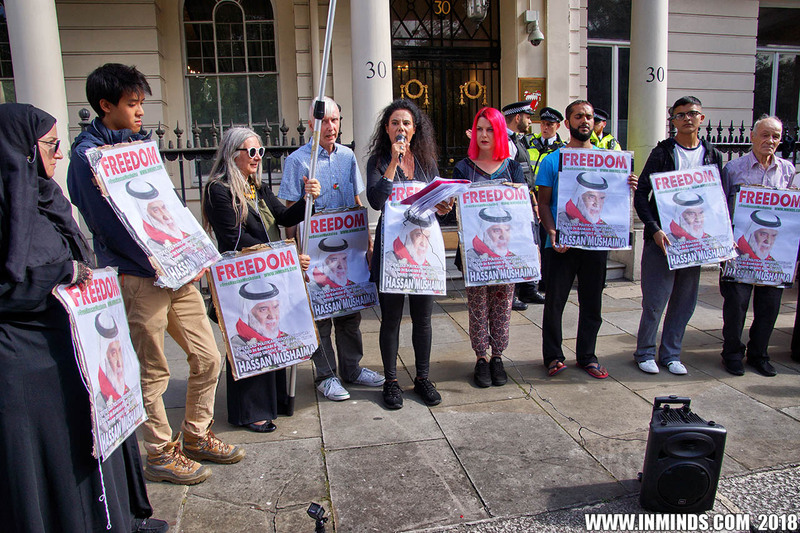 Once across the road they insisted we stay in the pen they had created for us, this we refused point blank - we were not entering their cage.